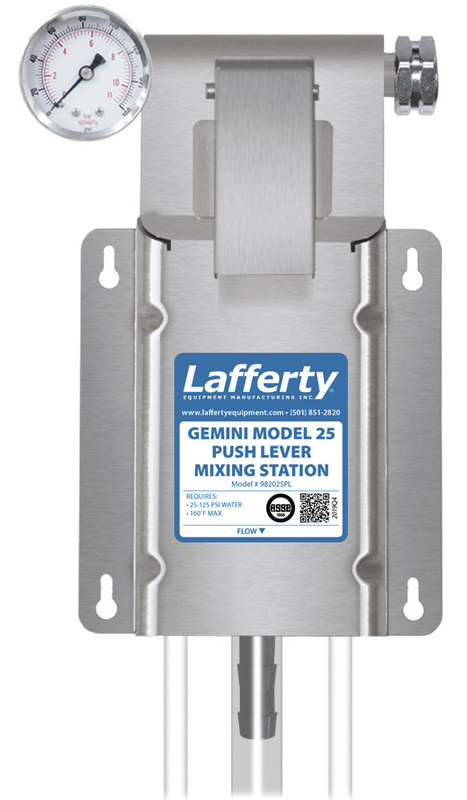 Gemini™ Model 25 Push Lever Mixing Station | Lafferty Equipment Manufacturing, Inc. The Gemini™ Model 25 Push Lever Mixing Station is a unique chemical proportioner that will simultaneously dilute and blend two chemical concentrates into one accurately diluted solution and dispense it into any sized container. The unique Gemini™ "double venturi" injection system incorporates two completely separated venturis in one injector body and uses city water pressure (25 - 125 PSI) to draw and blend 2 chemical concentrates into the water stream independently so that the chemicals never mix until they are diluted. Dilution ratios are controlled independently with precision metering tips. Push Lever Mixing Stations require the user to push and hold the lever to dispense.